OEM Manufacturer of a wide range of products which include miter cutting band saw machines. This mitre cutting band saws have has been conceived to obtain the best performance of productivity and blade-life for the steel structure industry. 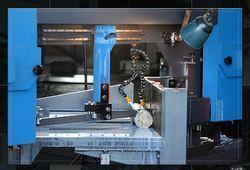 Mitre cutting band saw LMGS (M) are able to become the most important production centre in a steel structure workshop. These band saws are designed to accept any blade for each type of material, robust structure and aggressive cutting parameters for getting high production level and long blade life.